Diving for pop corn 6″X9″ Aquarell water graphite on illustration board. The seagulls are always an attraction by Lake Superior and especially near the popcorn stand. 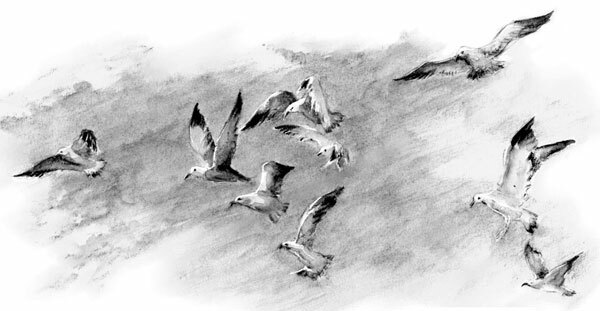 This is a quick water pencil sketch, as the birds do not pose in the air, one must build birds in short dashes and flashes of glimpses and brush strokes. The water graphite media is great for this as the tone and details can be enhanced with strokes of water both in process and later. I have found a #4 or #6 round sable works well to render most any small sketch. Then I found the water handle brush, it has it’s own water supply in the handle. A slight squeeze and you have a drop of water on the bristles. Quick and flexible and easy to carry both pencil and brush and water in your pocket. This entry was posted in Duluth Mn., HOME and tagged Aquarell, Duluth Mn., Lake Superior, popcorn, Seagulls on June 9, 2014 by eightdecades. Once again John some beautiful work. You can almost hear the gulls screeching.